Sunday August 9th 1903 It was a fine day. We went down town and I went to see Dr Dean & then went over home. We stayed till about the middle of the afternoon. I did some writing after coming home. 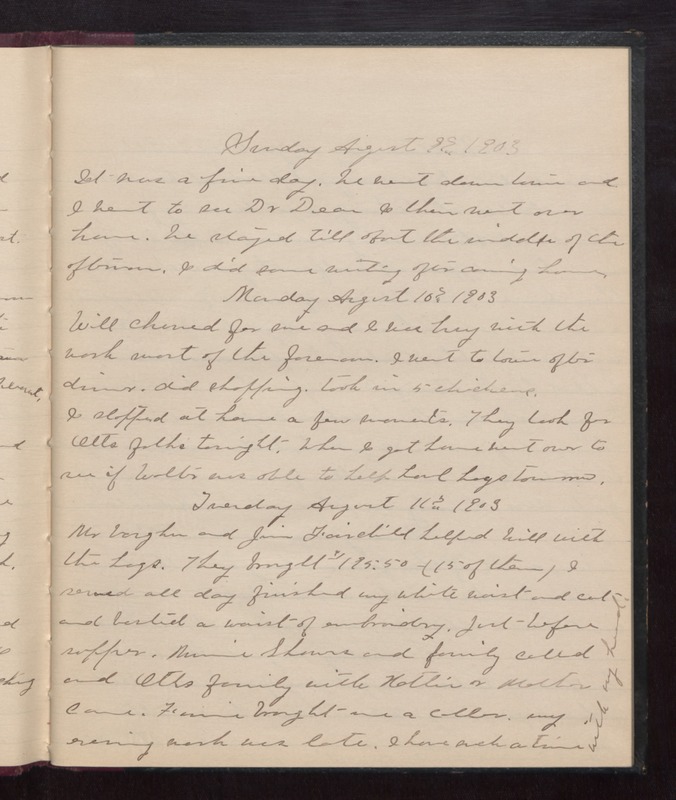 Monday August 10th 1903 Will churned for me and I was busy with the wash most of the forenoon. I went to town after dinner. did shopping. took in 5 chickens. I stopped at home a few moments. They look for Otts folks tonight. When I got home went over to see if Walter was able to help haul hogs tomorrow. Tuesday August 11th 1903 Mr Vaughn and Jim Fairchild helped Will with the hogs. They bought $195.50 (15 of them) I sewed all day finished my white waist and cut and [basted?] a waist of embroidery. Just before supper. Minnie Showers and family called and Otts family with Hattie & Mother came. Fannie brought me a collar. My evening work was late. I have such a time with my head!